Welp, we can all close the door on the Shia Labeouf meme. Put it to rest, this is the best use of the video We’ve ever seen. If you get to 1:11, you’ll see a stupendous rendition of the best part of Harder, Better, Faster Stronger. The pitch bending with the vocals are 100% on point and I would love to hear this remix pushed into a random funky house set. Bomp this loudly if you need some motivational love! It’s short, sweet and well produced. Annoy your co-workers with it on Monday. They’ll only hate you slightly for getting it stuck in their heads. Master Class: Chilly Gonzales Talking Daft Punk. This quick little video is something I think a lot of music commentary is lacking pretty severely. 1Live hosts an explanation of why Discovery is one of the best albums created in the last 2 decades. Aerodynamic is one of the better tracks on the album, and this explanation as to why. Baroque technical proficiency, added to disco beats and gesturing, instead of telling. Actual examples of musical concepts right there on the presentation, moving through time. This is tremendously useful for up & coming artists, especially those who haven’t had so much classical or theory training. 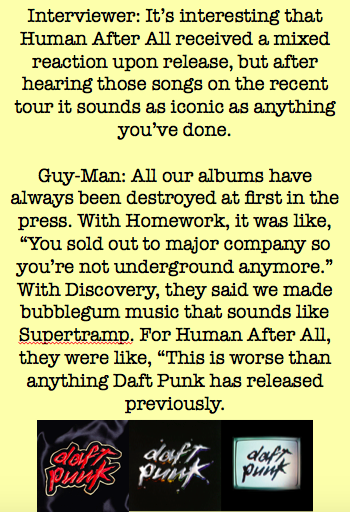 Also, giving you a way to prove to your friends that Daft Punk is better than their favorite band of course. Two Daft Punk Remixes Worthy Of The Name. It’s rare that I find a Daft Punk remix that stands. Daft Punk really does amazing work, so it’s really hard to remix their tracks and come up with anything better than the original. In addition to that, their rabid fan-base will obliterate any sub-par or disrespectful attempts. However, I have been lucky enough to stumble across a couple of remixes that even I cannot deny are legit. Interestingly, they’re both remixes of Voyager, one of the most underrated tracks not only on Discovery but of their entire library of work (in my opinion /hipster). The first, a remix by someone only known as Revolte, starts out like you think it will disappoint you, but then adds enough crunchy electro, confident organic synth work & massively Daft-sounding auto-tuning to earn the full listen. I have no idea where to find anything else by this artist, so all I can do is enjoy the interludes and hope they yell at me through the internet. Thankfully, I was able to track down the artist behind the second remix. Domenico Torti’s Wild Style edit features the best beat-remixing work I’ve heard from anyone who has attempted to use Daft Punk source material. Period. This is incredible, and borders on DMC championship level turntablism. The remix lets you breathe, pulling you back into familiar territory, then plays with you for the rest of the time. It’s a hip, upbeat, sophisticated remix that I expect to see attractive people drinking & wearing expensive things dancing to. In that “this is too well tailored, I really not trying to move” way. Dope vibe, so kudos, to both of our remixers, and will the first one please show themselves so I can thank you for being dope?